News by Matt S, Ginny W.
Atelier Lydie & Suelle: The Alchemists and the Mysterious Paintings, Koei Tecmo’s celebration of the 20th anniversary of the Atelier Series is slated for a Q1 2018 release: specifically, March 27. Much like its older sisters Atelier Sophie and Atelier Firis, it seeks to tell the tale of an ordinary girls getting into extraordinary adventures. With Atelier Lydie & Suelle, you’ll be playing as a pair of apprentice alchemists who have the ability to travel through paintings. We’ve definitely seen mechanics like this before, but judging from the powerhouse that was Atelier Firis, you can be sure that Koei’s latest release is going to be something special indeed. For those who are chomping at the bit, you’ll be able to preorder Atelier Lydie & Suelle soon through certain retailers or through Steam. If you get in quick, you’ll be able to snap up DLC in the form of costumes inspired by other beloved alchemists, the soundtrack, and Playstation themes if you’re pre-ordering it on that particular platform. On top of that, if you’re feeling nostalgic for your favourite alchemists then don’t fret! Atelier Lydie & Suelle will feature cameos from Sophie, Firis, Plachta and other series beloveds in a variety of roles. Koei Tecmo are definitely pulling out all the stops for this 20th anniversary release, and it definitely shows. Furthermore, the fact that Atelier Lydie & Suelle is also the first Atelier game to come to the Switch means that a port of the other fan favourite titles could be a real possibility. March 2018 can’t come soon enough! Radiant Historia was a smash hit on the DS when it was released in 2011. The brainchild of Atlus, it opened to rave reviews for its thought-provoking and poignant plot which focused on individual, player-made decisions having a huge impact on the outcome of the game (not typical for a traditional JRPG). You play as Stocke, a warrior with the ability to turn back time and the tough task of changing the fate of the world for the better through rewriting history. If you missed out on a chance to experience the original, then you’re in luck – it’s being ported and upgraded in the form of Radiant Historia: Perfect Chronology, and it’ll be available for the 3DS from February 13 2018 in the United States. It doesn’t just look better than the original Radiant Historia, even though the title looks like it’s going to undergo a substantial visual upgrade. Trailers for Perfect Chronology have shown off some pretty slick character art that’s been given a more modern flair thanks to what the 3DS is graphically capable of. There’s even an animated opening theme, an immense amount of voice-over work for cutscenes and regular character interactions, a new difficulty, as well as new songs from the original composer – Yoko Shimomura – of Final Fantasy and Kingdom Hearts fame. If this sounds like something up your alley, you’ll be glad to know that preordering the game in the United States and Europe will mean that you get a beautiful book of concept art for you to leaf through when you aren’t busy immersing yourself in the world of Radiant Historia: Perfect Chronology. It’s not too late to change your fate if you haven’t played it the first time; perhaps the next step for the revival of the franchise will be a Nintendo Switch release. Creeping Terror is coming to the Nintendo Switch, booyeh! Creeping Terror is a 2D stalker horror game from Sushi Typhoon, the same developer that produced the recent Tokyo Tattoo Girls. We’re quite enamoured with this new studio. It makes good games. Creeping Terror, though we haven’t written a review of it, is one of the better games released on the 3DS in recent months. But the 3DS being a console on its final legs isn’t getting games that aren’t by Nintendo the attention they deserve. 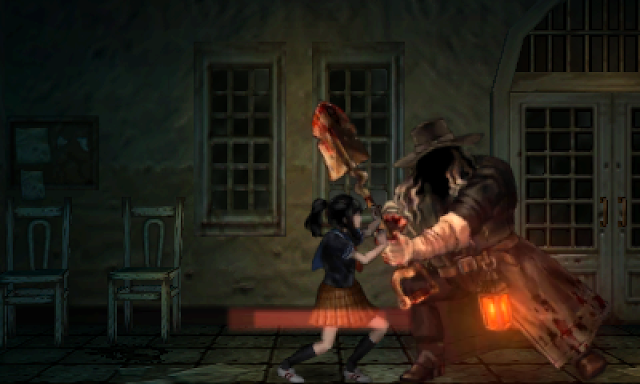 So Creeping Terror is making its way to the Nintendo Switch as a HD remaster. This is a game you should be really excited for, as it does take the traditional stalker horror genre of the Clock Tower era and do really interesting things with it. The Switch version will be the ultimate version, with an easy mode to make it more palatable for newbies or those less comfortable with horror games. It’s a game that will be worth dipping into for existing fans, too, as it will offer bonus costumes. Halfbrick is back with Shadows Remain! Australia's Halfbrick - the mobile specialist developer behind smash hits Jetpack Joyride and Fruit Ninja - has been a little quiet in recent months, but that's all fixed now, as the developer has released Shadows Remain. This is a story-driven augmented reality title, tasking players with following a journalist by the name of Emma Winters as she tries to save her son from the clutches of evil supernatural forces. There's a strong Stranger Things vibe to this one, in other words. According to the press release augmented reality is used to allow the player's real-world movements to control the game's dynamic camera, in turn allowing them to study surroundings and solve optical illusions. Unusually for Halfbrick, Shadows Remain is not a free-to-play, microtransaction-supported game. Instead, it's an episodic title, with the first episode available free now, and subsequent chapters will be available via in-app purchases. The game's augmented reality features requires iOS 11.